The Güell Palace in Barcelona is one of Gaudí’s earliest buildings (built between 1886 and 1890), and it’s the only one he ever fully completed. It has been closed to visitors since 2004 when a thorough renovation program was undertaken to repair cracked stonework that was causing structural problems. After seven years and 9 million euros, the restoration is finally complete. 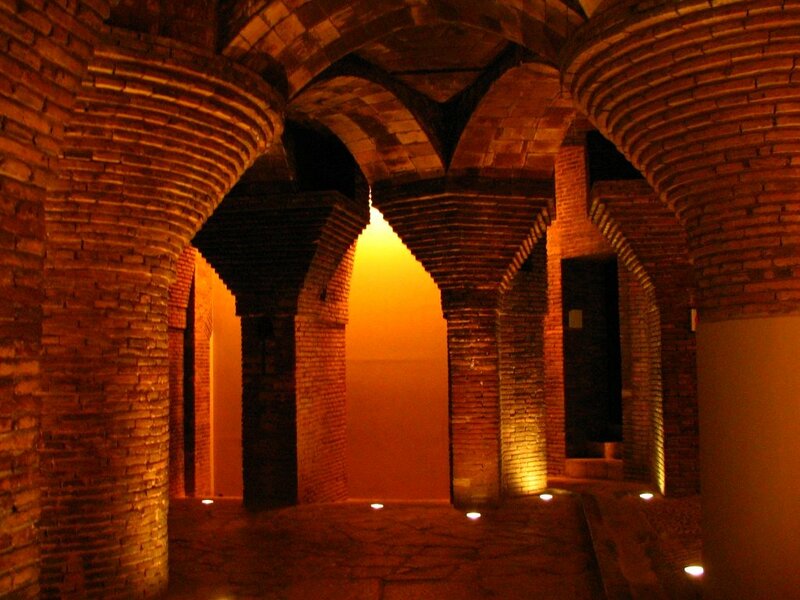 The Güell Palace reopens to the public on May 26th. The renovation also updated all the emergency facilities and climate control systems, but particularly focused on the lighting. 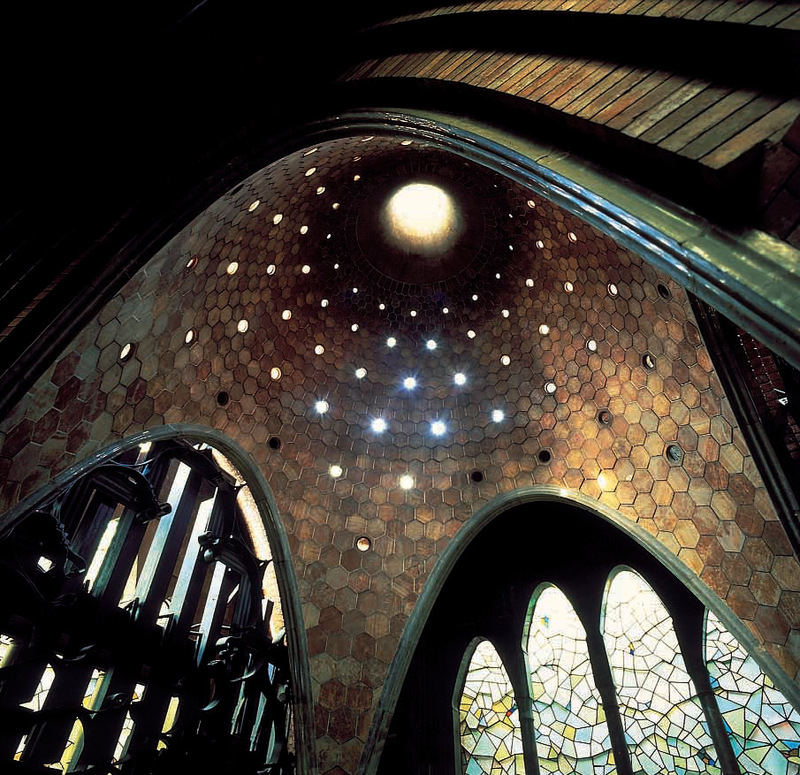 The interior is dark, thanks in part to Gaudí’s use of grey stone from the homeowner’s quarries, so restorers wanted to include additional light sources to illuminate the beauty of the materials used to build and decorate the palace. It’s also hot, even stifling during the peak tourist season in the summer, hence the installation of air conditioning. 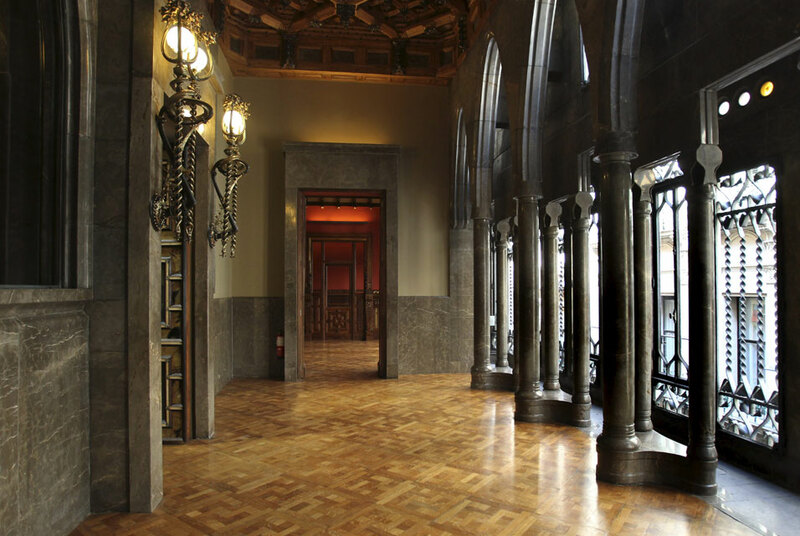 It was the Güell family home for 20 years, but when the Spanish Civil War came it became a Police Station, and later when belonging to the Diputación de Barcelona provincial government, was home to the Theatre Institute. Restoration started in 1982, but it was in 2004 when the doors were closed to the public for the final stages, under the direction of the architect, Antoni González. 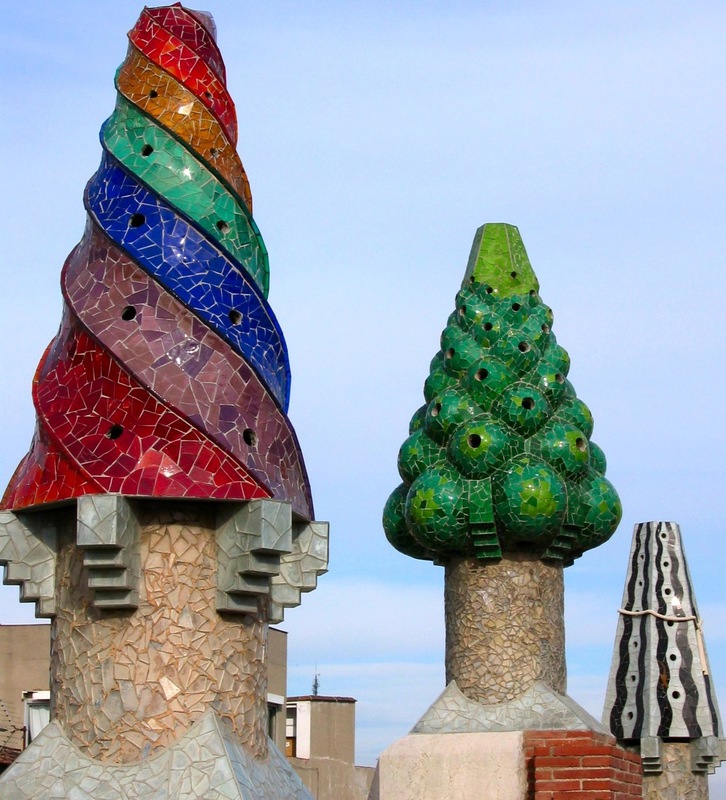 He’s now commented that the building is the best conserved Gaudi work and describes it as “the most genuine, the most authentic,” and with no additions. 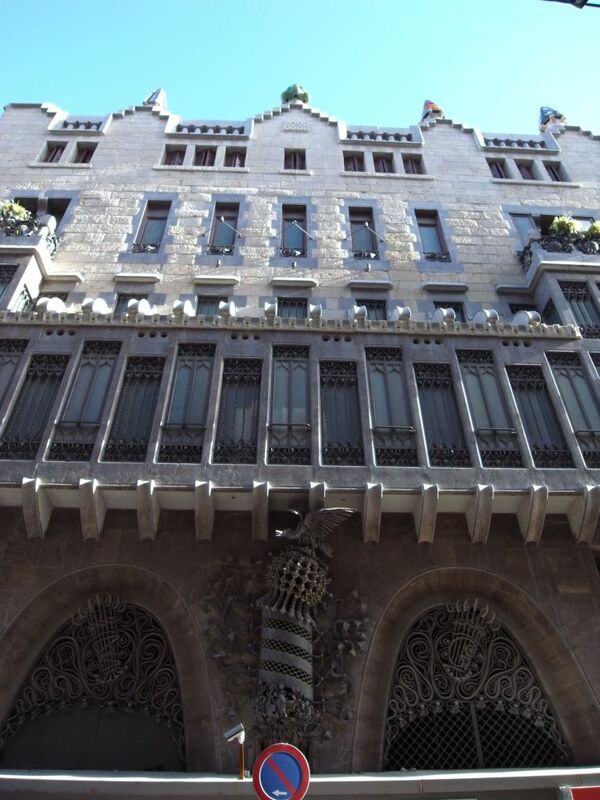 It broke all the postulates of 19th century romantic architecture, with its famous triple interior façade. Commissioned in 1885 by Catalan industrialist and patron of the arts Eusebi Güell, the palace showcases embryonic versions of Gaudí’s characteristic style, like Eastern and Gothic-influenced architectural features, parabolic arches, elaborate ironwork, and sculptural chimneys covered with trencadís (broken ceramic tiles). Unlike most of the Catalan Modernist buildings which were built in the fashionable Eixample area of Barcelona, the Güell Palace was built next to the existing Güell family home — they were connected at one point — in the old neighborhood of the city. Despite its untrendy (at the time) location, the palace was both a family home and a society party showpiece, with double iron gates in parabolic arch shape for coaches to drive right into the house and drop off the people to go upstairs to the receiving room while the horses were led down a ramp to the stables. The walls and ceilings of the receiving room are decorated with intricate woodwork that obscures small viewing windows the family would use to peek at their waiting guests from the floor above. The main entertaining room is topped by a soaring high ceiling with a dome that is perforated with graduated circles of holes up top. At night, lanterns were hung above the dome to shine through the holes and give the impression of a starry sky. The different sizes can give it a rotating effect. There is an organ on the second floor, and the acoustics of the domed room are apparently spectacular. Most of the palace is unfurnished, in part because it puts the focus on Gaudí’s brilliant architecture rather than the way the Güells lived their daily life, but also because the Güells simply took their furniture with them when they moved out during the Spanish Civil War. Once the doors open to tourists, only 160 people will be allowed in at one time (or 185; different articles give different figures) to keep the palace in good condition and to ensure visitors can all get out in case of emergency. This entry was posted on Sunday, May 15th, 2011 at 11:58 PM	and is filed under Modern(ish), Treasures. You can follow any responses to this entry through the RSS 2.0 feed. You can skip to the end and leave a response. Pinging is currently not allowed. Thanks for the lovely detailed pictures. They are always appreciated. That last photo….with the windows on the right…looks like a place setting for several different movies. One I think was a zombie move, like Resident Evil. I think it was a scene from Kill Bill as well. And I think one or two other movies. Usually, an action scene where the hero (or heroine) is being attacked by a bunch of people, and that hallway ends up getting destroyed in the process.